Okay, so before I start on my usual weekend post, let me get you all up to speed on last week. Varen had a pain in his left side, that for a week he kept thinking would go away on it's own. It didn't and finally on Wednesday morning he went to see the doc. The doctor said it didn't seem to be serious, but with weird internal pains there's a 5% chance it could be cancer or something. So he sent Varen off for an ultrasound. The dude taking the ultrasound did not have good news. Apparently he couldn't see any healthy tissue in Varen's right kidney and struggled to find his spleen - the kidney is covered in cysts (apparently he has Polycycstic Kidney Disease) and was blocking the view of the spleen. And the left kidney is apparently infected. They wanted to do a CT Scan but, because that involves injecting dye that needs to be processed by the kidney's he needed some other tests done first ... otherwise the dye could poison him. That was Wednesday. First thing Thursday morning, he went for blood and kidney function tests. And then we waited. Apparently the results of the "Urgent" lab work should've been back by lunch and if all was well, he could have the CT Scan that afternoon. We heard nothing. Eventually after he followed up with the Doctor, they discovered the lab "hadn't realised" the results were urgent and they'd only be ready on Friday. Okay, you can all breathe a sigh of relief now, as you can be sure I did too ... we got the lab results on Friday afternoon and he is fine. In spite of the cysts covering his right kidney, he has 100% kidney function. They said if they did the blood and function tests before the ultrasound, they'd never even bother to check his kidneys because they are in good working order. The cysts are more like a shell surrounding his kidney. So, besides starting his new job today, he'll also be going for the CT Scan this afternoon. I don't know at this stage what can be done. They still have to sort out the infection in the left kidney. If he sorts out his diet and goes to gym more often he should be fine for now apparently. But he'll have to be careful as he get's older and reaches 60. Am beginning to wonder if I should be looking for a new sperm-donor since it's genetic ;) Kidding! But you can not believe our relief on Friday ... it got a bit rough there last week. And so, Friday night was quiet, just spent at home together. And then he was off ... from 8:30am on Saturday morning till just after 11am on Sunday morning ... at his friend Koeties' bachelors. Sounds like the boys had a blast, they went go-karting and paintballing before braai-ing and staying over at some place out Lanseria way. The groom was quite lucky, his brother, the surgeon, fixed him up with some kind of banana bag after they carried him to bed round midnight and he was right as rain when he woke up on Sunday morning :) Now that's something I think every bachelor party needs. I will say Varen was the perfect boyfriend and I was lucky to get a few smses during the day. He understands that discovering the morning after a bachelors that my ex-boyf, Bean, was in hospital with stitches in his head leaves me a little paranoid about these things. So I just need to know that they're all alive and safe. Especially after the week we'd had! Poor boy, he could barely drink a thing ... but he still seems to have had a blast. Me, I had a very relaxing weekend. I bought new books for bookclub, had a drink with J9-double0blonde and Squeak and just generally enjoyed some me-time. On Sunday afternoon we went to see Varen's mom's new place. His folks are now officially divorced and living separately. Now hopefully you can understand a little of the chaos that's been going on unmentioned in the background. The first I heard mention of a possible divorce was when I landed after my East Africa trip ... in 2007. They've been in various stages of on and off since then. It's been exhausting. But his mom's new place is quite lovely and we had a good afternoon. 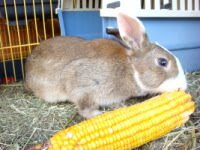 AND the bunnies were thrilled because we also got a bale of lucerne and an ear of corn from Varen's dad (I'll post a photo later) who had been at the farm this weekend. I am so glad for you both that it was nothing serious! I am so glad Varen is fine! Now I can understand why you were so stressed! I'd also have been freaking out. I am very, very glad he is OK! Wow that is scary! Relieved to hear all is fine - hope you guys have a wonderful week.